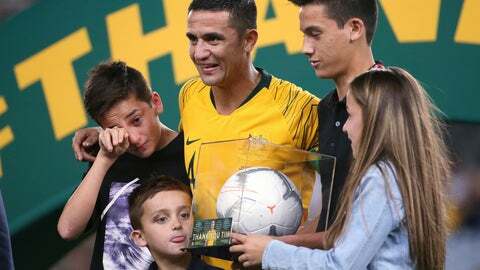 SYDNEY (AP) — Tim Cahill’s farewell game for Australia ended in a 3-0 win over Lebanon on Tuesday, leaving the Socceroos’ all-time leading scorer with 50 goals and 108 caps. Cahill, who scored in three of the four World Cups he contested, went on with about 10 minutes remaining at Sydney’s Olympic stadium, and his every touch was greeted with raucous cheers from the 33,268-strong crowd. The game was all but over when Cahill went on in the 82nd minute after Scotland-based Martin Boyle’s two first-half goals and Matthew Leckie’s score in the 68th. New Australia coach Graham Arnold was using the friendly as a chance to prepare his squad to defend the Asian Cup title in the United Arab Emirates in January, but Cahill’s cameo was the main drawcard.